We believe in creating a culture of quality, responsibility towards the environment and concerm for our employees’ health. For this reason, Antibiotice implemented an integrated Management System (quality, environment, occupational health and safety) which included all the processes taking place in the company, from research & development, acquisitions/procurement, production, control and distributions of drugs through our partners to the patients. Certification of the Integrated Management system was conducted in 2007 by Lloyd’s Register Quality Assurance, the latest recertification audit taking place in 2014. The Quality Management System according to the European EU GMP requirements was the first one implemented in our company and represented the basis for the development of the current existing management systems (quality, environment, health and safety at work). 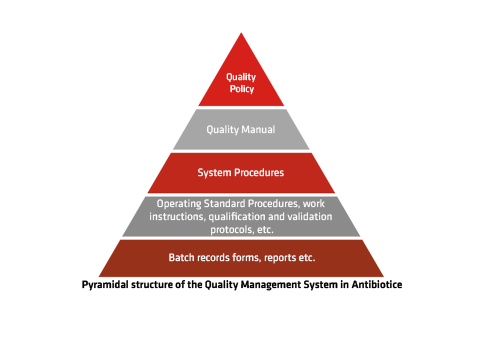 The compliance of the quality management system is performed internally (by our Quality Assurance Officers) and externally, by our raw material suppliers, business partners, the national authority in the field of medicine, NAMMD and other foreign authorities. The Quality Management System from Antibiotice was made compliant with the requirements of the cGMP USA system (the CFR 210 &211 requirements), this being attested by the inspection conducted by the FDA in 2013 and reconfirmed in 2015. This recognition has enhanced the confidence of our international partners in the robustness and performance of our quality system, making possible the existence of a common denominator and openness towards the entire world.